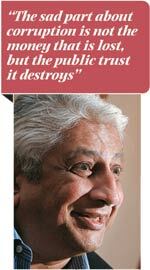 Ajit Gulabchand spoke with Business Today Editor Chaitanya Kalbag in a candid conversation punctuated by the grizzled philosophising that comes with years of dealing with the government as a client. 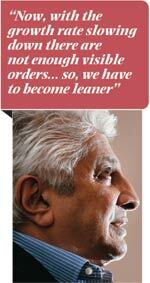 Ajit Gulabchand (AG) was delighted that his second grandson was born on his own 64th birthday. He had just come away from a meeting with a minister and other CEOs who were in the business of building highways. He has spent close to three decades at the helm of the Group, which builds roads, bridges, tunnels, hydroelectric and nuclear power plants and now townships, and traces its genes to the transportation empire founded by his uncle Walchand Hirachand that included aeronautics, automobiles and shipping. HCC Ltd has been in financial trouble- it reported a hefty Rs 222-crore loss in 2011/12 - and Gulabchand has been busy rescheduling debt and reviving the ambitious Lavasa project after it was nearly torpedoed by a zealous Environment Ministry. CK: HCC on a standalone basis suffered a Rs 222-crore loss in 2011/12 (after a Rs 71 crore profit the previous year). Was this the first time in your life you actually had to look at losses of this magnitude? AG: Yes. We got caught at the wrong time in a perfect storm. For example, we built the Bandra-Worli Sealink (in Mumbai). There are Rs 600 crore worth of claims that are still being discussed. Our processes have slowed down drastically. What should have been completed in a year after completing the job, they are still deciding. Nobody wants to decide! If you ask me, we are in a dire state. 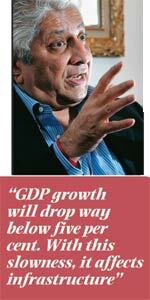 The GDP growth will drop way below 5 per cent. With this slowness it affects infrastructure. The visible order book at the beginning of the year for the whole infrastructure industry for the past two years was about $110 billion. For 2012/13 it is $75 billion. Out of that some $35 billion is still a question mark, depending on some policies. CK: Are you still planning the Lavasa IPO or is that permanently on hold? AG: Of course it is not on permanent hold. Now what we have done was, we looked at various ways to restructure HCC's debt because we couldn't pay it back. So we got that restructured through the Reserve Bank's corporate debt restructuring process. Then we also got the Lavasa debt restructured and refinanced (in principle). In both the cases, apart from restructuring, we have got additional financing. CK: Are those numbers available? AG: Yes, all the numbers will be available. So as a result, we don't talk too much about it. In today's atmosphere, everybody makes a noise about this. So we decided not to discuss CDR. CK: What tenure has the CDR has been done for? AG: Nine years. We will get out of it faster. We will then monetise some assets. We will collect some of these claims and pay back. It should be possible. (Around the time the Lavasa clearances came through in November 2011) the Indian banking went into a tizzy. So getting your refinancing sorted out became a longer process than we imagined. To be very honest, quite luckily, we could do this CDR in three months. CK: But you didn't go for any ECB or foreign borrowing? AG: I didn't want to. We returned our FCCB just a year ago in 2011. We were not going to go for any additional funding. We were afraid of the currency risks. Wisely, as it turned out. We wanted rupees. And we found that there is no way out of this. This money that the government owes us was not coming in a hurry. There was no way to repay. So looking at a way to realign the debt was very important. So we got the restructuring of the Lavasa debt done. Now the formalities in this are being done. We don't like to talk because every little becomes a big issue in the (news) tickers. "This has been done. Why was this done?" Then I refuse to talk on the subject only because of this. If I answer that, next day [it will be] "Gulabchand says this". The third day somebody else would say something else. So a one-day story becomes a five-day story. I am going to recommend a ticker tax. CK: Are you selling any core assets to get more cash? AG: No. There are two issues. One is obviously, whether there was a CDR or not, given the lean period that we are in, we have trimmed down. We had developed four or five verticals in the hope that each vertical would become the size of a company. Now with the growth rate slowing down there are not enough visible orders …so we have to become leaner. CK: What is your order book right now? AG: It is Rs 15,500 crore. CK: What have you done to tighten cost management? AG: We have collapsed these verticals (into one), made our organisation leaner. We will focus on all large projects. The other cost saving we are bringing about is in engineering. Everything in expansion mode always gathers a little bit extra so that we are trimming now. And next is we are sharpening our cash flow management. That's it. We will focus on fewer projects, large projects, expand more into the private sector, doing the same thing in a more humble and more concentrated way. CK: So what advice do you have for those who come into this sector? AG: I say if anybody wants to invest in this country for the short term, six months, one year, two years, go home, go elsewhere. For those who want to look at this in the long run, stay here. It is not bad; it is tough initially. Look at JCB, the construction equipment company. They are the largest in India. They will go through this trouble. CK: What keeps you going? AG: See this is the business I know. The most important thing is that I believe both these businesses - engineering construction and concession as well as urban development - are the dire need of Indian society so it is bound to expand. So you marry the ability to meet the need as well as to make money for your shareholder. Given the few glitches like these, I still think it is the best bet in the world to be here. I also have heritage - Walchand Hirachand. He was the founder of the transportation industry. He founded Hindustan Aeronautics, Hindustan Shipyard. He built Scindia Shipping. Automobiles. Construction. So you come from a stock that has, against certain odds, created entrepreneurship in this country. Once this hump is over, once this government is humbled from its control passion, it will start seeing that prosperity has to be brought in with speed if these people have to be kept satisfied. CK: Outside of Lavasa, what are the big things you are looking at? AG: Lavasa is a very large project. The ultimate investment in it is of Rs 50,000 crore. HCC builds, these are construction services, whether it is engineering and procurement and construction or EPC, it is a service industry. Concession is another way you own and manage assets. We now have about Rs 7,000 crore worth of assets under management. These are roads in different stages of construction and operation. CK: There is a perception that the 2000s, when several huge infrastructure projects were launched, also triggered very large-scale corruption. AG: I do not dwell on the word corruption too much for one reason: are we having policies that go forward? When you see the word corruption...it is everywhere. The jails all over the world are full increasingly with white-collar crime. So I am not saying therefore that I support corruption. I am only saying that, that doesn't seem to be the reason why progress does not happen. Progress happens because of good policies, creation of a market economy. The sad part about corruption is not the money that it loses, but the public trust it destroys. And therefore it stalls decision making. Because every time probably trust is destroyed, every decision maker wants to be absolutely sure that he is above board; "so I took my time". If he gives decisions too early, which he should, he will be doubted. So he spends all his time to tell the world he is kosher. And yet the public does not believe him because it has lost trust. This is the biggest danger of corruption in my opinion. However a lot of policies lead to corruption. For example, the solution to certain types of corruption is having plenty. When we were kids we used to have a terrible time about milk. We used to stand in queues for milk. Milk adulteration was a daily occurrence. There was a shortage. The moment 'Operation Flood' started, India now throws away milk every day. Do you hear of milk adulteration? We don't any more. No price rigging of milk because it is so plentiful. So sometimes, creating plenty solves the corruption.